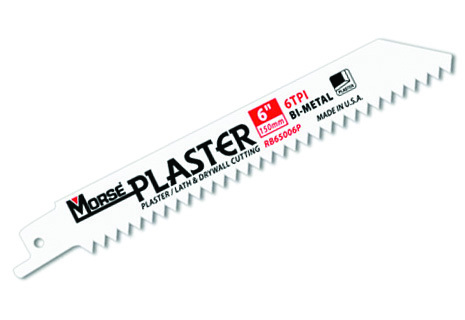 The Morse PLASTER reciprocating saw blade is specifically designed for cutting drywall, plasterboard, and plaster with wood or metal lath. With a "V" style tooth, cut edge fraying/chipping is significantly reduced, requiring less finishing. .050" thickness for increased rigidity and heavier feed pressure. Blades widths of 3/4" provides flexibility. Special "v" tooth design for smooth cutting action. Bi-metal construction for long cutting life and heat and wear resistant.